Hola! 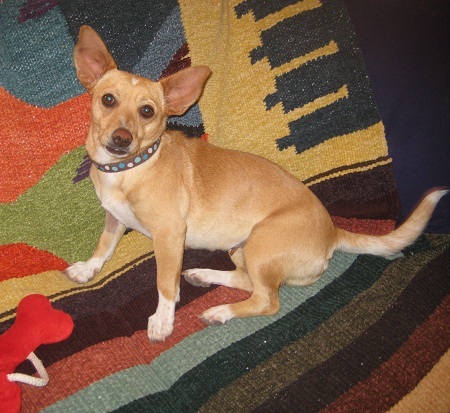 My name is Stella Bella and I have the biggest personality jam packed into this 15 lb Chihuahua-mix body. Recently, at 3 years old, I was rescued from the streets of Mexico, and although that may not have been the most ideal way of growing up it definitely turned me into a super social little girl! I am the life of the party, and a little mischievious too (was it me who spiked the punch? I’ll never tell!). I am extremely smart and eager to start learning tricks. I would also be a perfect companion for all of those outdoor activities so popular in summer, hiking, canoeing, and I can build a pretty mean bonfire too. Have other dogs? No problem! I am great. Cats? I LOVE them. Because of my size I do prefer a home without young children. Do I sound like just the pup for you? Then fill out an application at pixieproject.org and send it in so we can schedule a meet and greet. I am fixed, vaccinated and microchipped. My adoption fee is $180 and I am currently living in foster care.